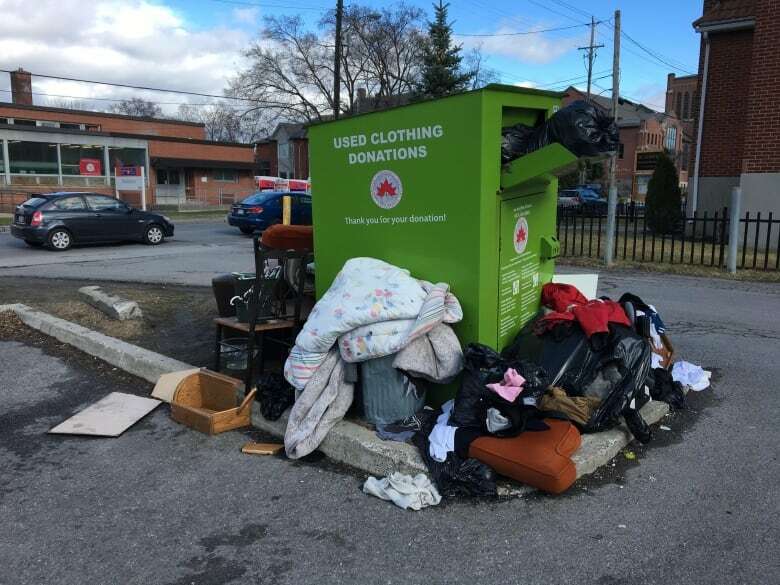 Charities that distribute clothing donation bins in Ottawa are rushing to fix them after a string of incidents in other cities in which people became trapped inside, including several reported fatalities. The problem is a hatch that's designed to prevent theft, but which can also trap people who lean far into the boxes. Earlier this week, a woman in Toronto died in a bin, and the Canadian Press reported last week that seven other people in Canada — mostly in British Columbia — have perished the same way since 2015. The manufacturer of the bin involved in the Toronto tragedy, Rangeview Fabricating, has stopped production and is urging charities to remove the anti-theft bars and add warning labels. Rangeview also supplies bins to Diabetes Canada. "We're working with our manufacturer to retrofit or modify each and every bin across Canada to prevent this from happening," said Kathleen Powderley, a spokesperson for Diabetes Canada. In a statement on its website, the charity said it has already completed 240 retrofits in Ontario and planned to fix a total of 4,000 bins across the country by Jan. 18. According to the statement, donations of clothing and small household goods are a major source of the charity's revenue, accounting for a quarter of its total revenue in 2017. Now the charity will have to incur the cost of labour and some of the parts necessary to complete the retrofits, Powderley said. Other charities with bins in Ottawa said they're also working with their suppliers to do retrofits. They include the Ontario Federation for Cerebral Palsy, which operates 60 bins in the city, as well as the Children's Wish Foundation of Canada, which has 41. Other charity operators say their bin designs are safe. Ottawa Neighbourhood Services operates about 25 bins across the city, but they're made of wood with a simple flap across the opening, said Patricia Lemieux, president of the organization's board. "There's nothing in it that springs shut or slams shut on top of you," Lemieux said. According to a news release issued Thursday by Big Brothers Big Sisters Ottawa, the organization's 19 bins don't have rolling chutes and are also "strategically placed in well-lit, high traffic areas near cameras, which helps to mitigate risks." The charity said it would nevertheless post warning signs on bins immediately. The Canadian Community Support Foundation did not respond to CBC Ottawa's request for comment. However, Daniela Siggia, a spokesperson for Textile Waste Diversion — the company that supplies their bins — posted a video statement on Facebook on Monday. According to the statement, the company is retrofitting existing bins and will change the design of new ones as a precaution, even though its bins aren't identical to the ones involved in the recent deaths. "The issue here is not the bins per se, but actually an increase in extreme poverty that is leading to an increase in individuals attempting to access these bins in an unsafe way," Siggia said. "Legislators and media that are putting the focus on bins is a convenient distraction from the root cause of these fatalities." A friend of the woman who died in the recent Toronto incident told CBC she believed the woman was trying to retrieve warm winter clothes from the bin when she became trapped. 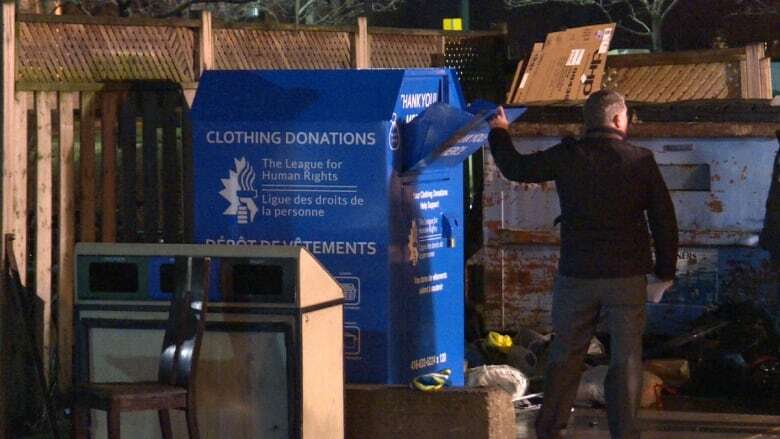 After this week's death, Toronto Mayor John Tory announced he would request a review of Toronto's donation bin system, including their location, design and whether they're the best way to collect clothing. In Ottawa, charities can apply to the city for permission to place bins on city property, while a 2013 bylaw sets out the rules for bins on private property. The bylaw requires bin operators to respect the city's rules around property standards and maintenance, but does not specifically address bin safety. "At this time, there is no By-law review planned," said Livia Belcea, a spokesperson for Ottawa Mayor Jim Watson. "Our office will continue to monitor developments and potential By-law reviews of clothing donation boxes in other municipalities."